Located in the historic Corn Hill Neighborhood, Corn Hill Landing Apartments is a luxury apartment community in Rochester, New York. Boasting a gorgeous brick exterior, the goal of Corn Hill Landing Apartments is to recapture the charm of a traditional European-style village and, inside, our interiors feature the finest comforts of modern luxury. A magnificent view of the Rochester city skyline is just the first of many highlights you'll notice at Corn Hill Landing Apartments. High-end touches include elegant vaulted ceilings and skylights, cozy fireplaces, and private balconies and patios. Best of all, our apartment community features boutique shops and services on the premises as well as unique and popular dining opportunities. Start living life the way you deserve, and come home to Corn Hill Landing Apartments today! Located along Interstate 490, Corn Hill Landing Apartments boasts a convenient location in the heart of Rochester, New York. 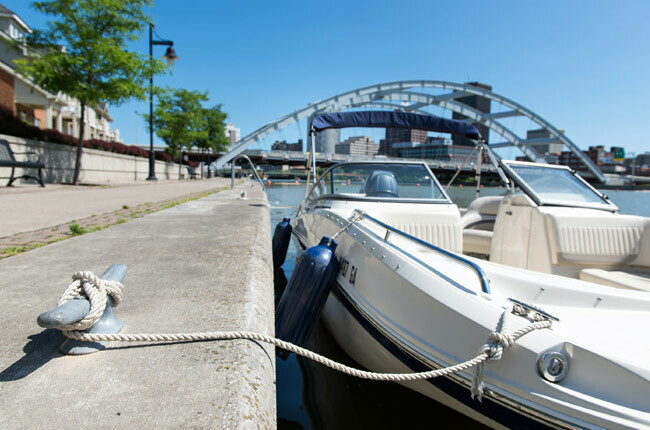 The Genesee River is practically at your front door, offering residents the opportunity to hike, bike, or dine beside this beautiful natural backdrop. Continue to revel in the natural beauty of the area by spending a sunny afternoon at Lunsford Park, Genesee Gateway Park, or Marie Daley Park, which offer amenities such as trails, playgrounds, and boat ramps. If you prefer indoor recreation, the area features every type of cuisine your heart could possibly desire: indulge in Southern-style barbecue, authentic Italian, or specialty sandwiches and hamburgers. Other nearby points of interest include Memorial Art Gallery, Rochester Museum & Science Center, and The Little Theatre. As far as a central location is concerned, we have you covered at Corn Hill Landing Apartments.